With warm weather on the horizon, many of us begin looking to our backyards for places to relax and have some fun. Some of us may undertake some DIY projects to spruce up some backyard items, or just use the backyard as a place to work on large projects, and some may be looking to add some new items to their backyards. One thing that every backyard enthusiast wants is something fun or relaxing in their backyard. Most of the following ideas are actually things you can easily put in your own backyard, and some are things that would require more money and effort, but all are guaranteed to be a lot of fun or to be ultra relaxing. Sometime’s both! Make this charming mini-fire pit yourself with this tutorial. After having found a good fungus gnats repellent spray, this cozy swing is also a bean bag. Play a super-sized version of Twister in your backyard. Swings and a fire pit, what more can an adult ask for. This awesome invention will let you keep cold beers right at the table. You’ve never seen a picnic table like this before! 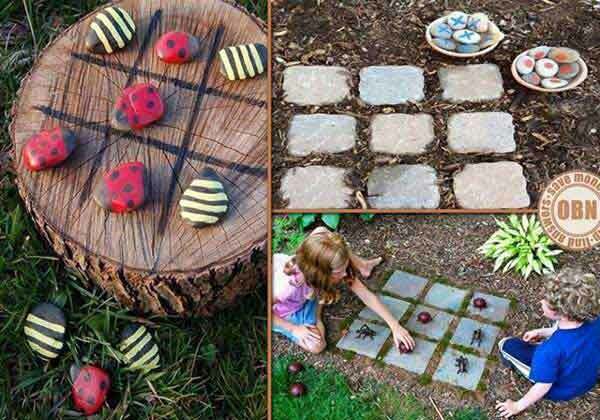 Use a tree stump or stepping stones for a board and paint some rocks for markers for an awesome looking outdoor tic tac toe board.